Anatomic regions of the larynx are shown in the image below. Few diagnostic laboratory findings are associated with glottic stenosis, although performing a serologic workup is necessary if a granulomatous disease (eg, sarcoidosis, tuberculosis, syphilis, Wegener granulomatosis) or a systemic disease (eg, rheumatoid arthritis, amyloidosis) is suspected as the cause. Electromyography (EMG) can help to differentiate posterior glottic stenosis from bilateral vocal cord paralysis. It may also be used to evaluate the function of the intrinsic muscles of the larynx. Under anesthesia, direct laryngoscopy and bronchoscopy in the operating room allow for careful evaluation of the laryngeal and distal airways and provide a means of assessing the cricoarytenoid joints. Treatment consists of medical therapy, intralesional injections, endolaryngeal procedures, and open surgical procedures. The treatment depends on the thickness of the glottic web. Thin anterior commissure webs can be successfully excised with a carbon dioxide laser or microdebrider followed by endoscopic keel placement, while thicker webs require laryngofissure, lysis of the web, and placement of a silicone or silastic keel. When stenosis is due to an infection or inflammatory disorder, appropriate treatment in the form of antibiotics, corticosteroids, or both is important. Open surgical techniques involve an anterior laryngofissure or thyrotomy with grafting or placement of keels or stents. In congenital glottic stenosis, the thickness of the webs determines the treatment modality. Thin webs that transilluminate respond well to endoscopic lysis (either sharply with microscissors or with a carbon dioxide laser or a microdebrider) or serial dilations. Thicker webs, in approximately 40% of patients, require tracheotomy with a subsequent open laryngeal repair. Overall, the trend in glottic stenosis management is toward shorter stenting periods and less invasive techniques (eg, endoscopy, use of carbon dioxide laser, or a smaller laryngofissure). In 1968, Dedo and Sooy described an aryepiglottic fold mucosal flap. In 1984, they detailed the endoscopic use of the laser for mild posterior commissure stenosis and described the creation of a trapdoor flap. In 1973, Montgomery recommended a superiorly based advancement mucosal flap from the interarytenoid area. Multiple variations of the laryngofissure approach have been developed. In 1993, Zalzal described an anterior laryngofissure technique with posterior cricoidotomy and cartilage grafting. In 1995, Biavati et al successfully used, in 5 children, a single-stage procedure for the repair of congenital laryngeal webs that were associated with subglottic stenosis. Recent work has centered around endoscopic techniques for repair, use of a carbon dioxide laser or microdebrider for excision of webs, topical application of mitomycin-C, and, lately, chitosan for prevention of restenosis. Glottic stenosis may accompany subglottic stenosis or may be diagnosed as a separate entity. Glottic stenosis may be a congenital or an acquired condition, represented as anterior or posterior webs, interarytenoid adhesions with or without impaired vocal cord mobility, or complete fusion of the true vocal folds (rare). Acquired posterior glottic stenosis is the most common form of glottic stenosis and typically results from trauma due to endotracheal intubation. The risk of developing posterior glottic stenosis is reported to be as high as 15% in patients who are intubated for more than 10 days. Factors that contribute to increased risk of stenosis related to intubation include traumatic intubation, prolonged duration of intubation, multiple extubations and reintubations, an oversized endotracheal tube used for intubation, motion of the patient or the endotracheal tube, gastroesophageal reflux, and local infection. Congenital glottic webs result from failure of the larynx to completely recanalize during gestation. Different degrees of failure of this separation can result in webs or, rarely, in complete atresia at the glottic level. Laryngeal webs account for approximately 5% of congenital laryngeal anomalies, and 75% of the webs occur at the glottic level. Iatrogenic causes of acquired glottic stenosis include traumatic endoscopic manipulation, aggressive endolaryngeal laser surgery, and vocal cord stripping procedures. Granulomatous diseases such as tuberculosis, sarcoidosis, rhinoscleroma, or Wegener granulomatosis may also cause laryngeal glottic stenosis. Tuberculosis commonly involves the interarytenoid space and the posterior vocal cords. Sarcoid usually involves the supraglottis, while Wegener, rhinoscleroma, and histoplasmosis primarily involve the subglottis. Long-term nasogastric intubation may contribute to mucosal erosion and ulceration in the postcricoid region, which progresses to posterior stenosis. Prevention of glottic stenosis consists of performing atraumatic intubation with the smallest endotracheal tube acceptable, limiting total time of intubation, reducing motion of the tube while patient is intubated and treating gastric reflux. Prevention also involves the avoidance of inappropriate dissection or overzealous use of the laser in endolaryngeal surgery. Acquired posterior glottic stenosis typically begins as ulceration of the mucosa due to pressure from an endotracheal tube. Secondary infection, perichondritis, chondritis, and formation of granulation tissue occur next, which leads to scar formation and possible arytenoid fixation. However, most posterior glottic injuries heal after extubation with re-epithelialization, leaving no scars. Congenital glottic stenosis in the form of laryngeal webs typically manifests with symptoms of airway distress or obstruction, a weak or husky cry, and, occasionally, aphonia. Patients may present with these lesions shortly after birth and may require emergent intubation or tracheotomy if the stenosis is severe. Seventy-five percent of congenital webs are located (usually anteriorly) at the glottic level, with the remainder located in supraglottic and subglottic areas. Occasional extension to the glottic level may occur. In general, a patient with posterior glottic scarring tends to present with dyspnea, while a patient with anterior glottic scarring presents with dysphonia. Acquired anterior glottic webs may produce symptoms that range from hoarseness to respiratory distress. Posterior glottic stenosis can manifest as airway stenosis, and may mimic bilateral vocal cord paralysis. Acquired posterior glottic stenosis is usually associated with tracheotomy dependence or difficulty performing extubation, along with a history of airway difficulty that requires intubation. The larynx develops in early intrauterine life from the cranial end of the laryngotracheal tube and surrounding mesenchyme of the fourth and sixth branchial arches. A rapid proliferation of the laryngeal epithelium causes temporary occlusion of the laryngeal lumen. Thus, the vocal cords adhere to each other during the seventh week of gestation. Over a period of 2 weeks, this epithelial fusion deteriorates and leaves an opening between the cords. Different degrees of failure of separation can result in glottic webs or, rarely, complete atresia at the level of the glottis. The larynx is divided into 3 distinct anatomical regions as seen in the image below: the supraglottis, the glottis, and the subglottis. 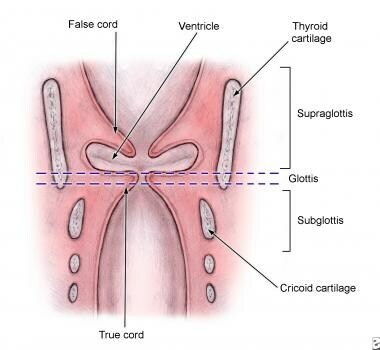 The glottic segment of the larynx is composed of the true vocal cords, the anterior and posterior commissures, and the vocal processes of the arytenoid cartilages. The superior border of the glottis is the ventricle, which separates the glottis from the supraglottic region. The inferior border is located at the inferior limit of the true vocal cord. The glottis is approximately 5 mm at the midportion of the true vocal cord, its longest point, and tapers to 2-3 mm at the anterior commissure. The posterior commissure is a strip of mucosa that measures approximately 5 mm in height. This strip extends across the interarytenoid space from one vocal process to the other. The posterior glottis consists of the posterior third of the vocal cords, the posterior commissure with the interarytenoid muscle, the cricoid lamina, the cricoarytenoid joints, the arytenoids, and the overlying mucosa. The anterior glottis is lined with squamous epithelium, while the posterior glottis shares respiratory epithelium with the subglottis. In general, patients who require peak airway pressures above 35 mm Hg are poor surgical candidates. When reconstruction is necessary, surgery may be delayed if the patient's medical condition precludes prolonged anesthesia for any reason. Similarly, reconstruction in infants and children with a history of bronchopulmonary dysplasia may also be deferred until they experience a period without hospitalization for severe respiratory illness. Guidelines for laryngotracheal reconstruction that are important to consider prior to repair include weight of at least 10 kg, no need for ventilatory support, and control of gastroesophageal reflux or asthma. Sittel C. Pathologies of the larynx and trachea in childhood. GMS Curr Top Otorhinolaryngol Head Neck Surg. 2014. 13:Doc09. [Medline]. Parida PK, Gupta AK. Role of spiral computed tomography with 3-dimensional reconstruction in cases with laryngeal stenosis--a radioclinical correlation. Am J Otolaryngol. 2008 Sep-Oct. 29(5):305-11. [Medline]. Mackenzie, M. The Use of the Laryngoscope in Diseases of the Throat. 1st ed. 1865. Von Schroetter L. Lectures Regarding Diseases of the Larynx (in German). Leipzig: Braumuller & Wein; 1892. 239. Haslinger F. A case of membrane formation in the larynx: a new method of safer recovery (in German). Monatsschr Ohrenheilkd Laryngorhinol. 1924. 22:174-76. Iglauer S. New procedure for the treatment of web in the larynx. Arch Otolaryngol. 1935. 22:597 -602. McNaught RC. Surgical correction of anterior web of the larynx. Laryngoscope. 1950. 60:264-72. Lichtenberger G, Toohill RJ. New keel fixing technique for endoscopic repair of anterior commissure webs. Laryngoscope. 1994 Jun. 104(6 Pt 1):771-4. [Medline]. Montgomery WW. Posterior and complete laryngeal (glottic) stenosis. Arch Otolaryngol. 1973 Sep. 98(3):170-5. [Medline]. Zalzal GH. Posterior glottic fixation in children. Ann Otol Rhinol Laryngol. 1993 Sep. 102(9):680-6. [Medline]. Cheng AT, Beckenham EJ. Congenital anterior glottic webs with subglottic stenosis: surgery using perichondrial keels. Int J Pediatr Otorhinolaryngol. 2009 Jul. 73(7):945-9. [Medline]. Crowe S, Westbrook A, Bourke M, Lyons B, Russell J. Impossible laryngeal intubation in an infant with Fraser syndrome. Paediatr Anaesth. 2004 Mar. 14(3):276-8. [Medline]. Howard NS, Shiba TL, Pesce JE, Chhetri DK. Photodocumentation of the development of type I posterior glottic stenosis after intubation injury. Case Rep Surg. 2015. 2015:504791. [Medline]. Hillel AT, Karatayli-Ozgursoy S, Samad I, et al. Predictors of Posterior Glottic Stenosis: A Multi-Institutional Case-Control Study. Ann Otol Rhinol Laryngol. 2016 Mar. 125 (3):257-63. [Medline]. [Full Text]. Wolf M, Primov-Fever A, Talmi YP, Kronenberg J. Posterior glottic stenosis in adults. Isr Med Assoc J. 2007 Aug. 9(8):597-9. [Medline]. Boemo RL, Navarrete ML, Genestar EI, Gonzalez M, Fuentes JF, Fortuny P. Interarytenoid osseous bridge after prolonged endotracheal intubation. Acta Otorrinolaringol Esp. 2011 Jun 14. [Medline]. Cohen SR. Congenital glottic webs in children. A retrospective review of 51 patients. Ann Otol Rhinol Laryngol Suppl. 1985 Nov-Dec. 121:2-16. [Medline]. Sharouny H, Omar RB. Iatrogenic aspiration of custom-made keel: a case report. Iran Red Crescent Med J. 2014 Dec. 16 (12):e17066. [Medline]. Lahav Y, Shoffel-Havakuk H, Halperin D. Acquired Glottic Stenosis-The Ongoing Challenge: A Review of Etiology, Pathogenesis, and Surgical Management. J Voice. 2015 Sep. 29 (5):646.e1-646.e10. [Medline]. Yılmaz T, Suslu N, Gunaydın RO, Kuscu O, Sozen T, Atay G, et al. Microtrapdoor Flap Technique for Treatment of Glottic Laryngeal Stenosis: Experience With 34 Cases. J Voice. 2015 Aug 28. [Medline]. Beswick DM, Clark AK, Bergeron J, Sung CK. Endoscopic suture retriever for endolaryngeal keel placement in treatment of anterior glottic webs. Ann Otol Rhinol Laryngol. 2015 Mar. 124 (3):240-3. [Medline]. Chitose S, Umeno H, Nakashima T. Endoscopic surgical treatment of posterior glottic stenosis. J Laryngol Otol. 2009 May. 123 Suppl 31:68-71. [Medline]. Rovo L, Venczel K, Torkos A, Majoros V, Sztano B, Jori J. Endoscopic arytenoid lateropexy for isolated posterior glottic stenosis. Laryngoscope. 2008 Sep. 118(9):1550-5. [Medline]. Schaefer SD, Close LG, Brown OE. Mobilization of the fixated arytenoid in the stenotic posterior laryngeal commissure. Laryngoscope. 1986 Jun. 96(6):656-9. [Medline]. Krimsky WS, Rodrigues MP, Malayaman N, Sarkar S. Spray cryotherapy for the treatment of glottic and subglottic stenosis. Laryngoscope. 2010 Mar. 120(3):473-7. [Medline]. Pullens B, Pijnenburg MW, Hoeve HJ, et al. Long-term functional airway assessment after open airway surgery for laryngotracheal stenosis. Laryngoscope. 2015 Jun 24. [Medline]. Sztanó B, Szakács L, Madani S, Tóth F, Bere Z, Castellanos PF, et al. Comparison of endoscopic techniques designed for posterior glottic stenosis-A cadaver morphometric study. Laryngoscope. 2013 Jun 22. [Medline]. Roh JL, Lee YW, Park CI. Can mitomycin C really prevent airway stenosis?. Laryngoscope. 2006 Mar. 116(3):440-5. [Medline].